Crawford Garage Doors sells and services commercial gate openers from LiftMaster and USAutomatic. Engineered for more than a million cycles in high-traffic heavy-duty applications, the CSW24VDC is ideal for the most demanding swing gate environments. Engineered for more than a million cycles, designed to perform in the most demanding applications. Get on and off your property even when the power’s out with our Battery Backup feature and ultra-efficient Power Management System – up to 146 cycles or 24 days. Rated for gates up to 18 feet in length and weighing up to 1,200 pounds. Get durable protection and easy service access with the High-Impact Polyethylene Cover. Extend the life of the Operator with a powerful AC Motor. Rated for gates up to 18 ft. in length weighing up to 600 lbs., 22 ft. in length weighing up to 1000 lbs. or 20 ft. in length weighing up to 600 lbs. (depending on the motor selected). With our built-in Security+ 2.0® interference-eliminating technology, you can be confident that your property is secure and only your remote will open and close your gate. Our innovative plug-in loop detectors ensure that vehicles interrupt gate closure if a vehicle is in its path. Get on and off your property even when the power’s out with our Battery Backup feature and ultra-efficient Power Management System – up to 208 cycles or 24 days. 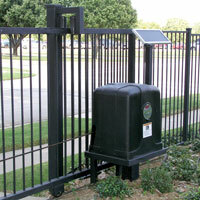 Rated for gates up to 50 feet in length and weighing up to 1,500 pounds. The SL3000UL models are the first choice for heavy-traffic applications. Featuring the highest quality components and backed by years of proven reliability, each unit is carefully inspected and mechanically tested to provide unsurpassed performance. Extend the life of the Operator with soft start/stop operation and a powerful 12VDC Motor. With our built-in Security+ 2.0® interference eliminating technology, you can be confident that your property is secure and only your remote will open and close your gate. 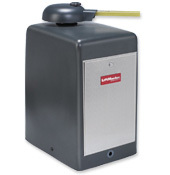 LiftMaster gate operators complies with UL 325 standards. Secondary entrapment devices must be added to meet UL 325 standards. Your installer will recommend suitable secondary entrapment devices such as photo eyes or edge sensors. 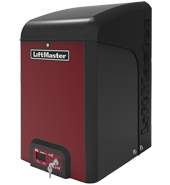 The LiftMaster® SL585 is a durable heavy-duty gear-driven operator for use on heavy gates and high-cycle applications such as gated communities and industrial locations. Provides High-starting torque, continuous duty AC industrial motor with overload protection. Features Heavy-duty Wormgear-in-Oil Gear Reducer. Fits your current power requirements with 115/208/230 VAC Power Single-Phase, 208/230/460 VAC Three-Phase options. Allows the gate to travel at 11” per second. Protects against door and operator damage due to obstacles with the Adjustable Friction Clutch. 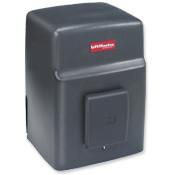 Resists the elements with a Pad Lockable Weather-Resistant Lockable Cover. Easily access and maintain the operator with a large control box and accessory tray. Fits most sites with its universal footprint. Supports Long-Distance Digital Logic Control (supports runs over 1,000 feet) to give you greater flexibility of Operator placement. Applies Open/Close/Stop functions with the standard three-push-button control station. Controls with one, two and three buttons are available. Features an Industrial-Size 0 Across-the-Line Magnetic Reversing Contactor. Easily install and maintain the Operator with a fully adjustable driven limit system. Comes with Pad and Post Mount Standard. Includes a a 5 ft. #50 Nickel Plated Chain for durable operation. 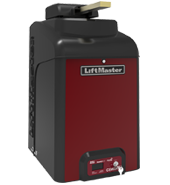 Have peace of mind with LiftMaster®’s 2-Year Warranty. Access your facility quickly and safely with Security+ 2.0™ Technology, which virtually eliminates interference and offers up to 2X the range of standard remotes. Stores up to 90 remotes with the built-In 850LM Security+ 2.0™ receiver. Protect vehicles from damage with an Inherent Entrapment Protection System that stops, reverses and stops again if it comes in contact with a vehicle. Adds substantial gate position control at all points in travel with an Automatic Braking System. Activates/Deactivates the Integrated Maglock to electronically lock down the operator. Allows for a full range of optional external devices with Interrupt & Exit Loop Detector Inputs. Compliant to all UL 325 standards for Class I, II, III and IV. The LiftMaster® SL595 is an extreme heavy-duty operator for industrial locations such as manufacturing plants and truck depots. Rated for gates up to 70 ft. in length weighing up to 1700 lbs., 80 ft. in length weighing up to 2100 lbs. or 90 ft. in length weighing up to 2500 lbs. (depending on motor selected). 25 cycles per hour. Know when your gate is about to open or close with a pre-motion warning. Specifically engineered to meet the low clearance needs of apartment houses and condominiums, the HCT delivers unsurpassed safety, dependability and quiet operation. Supports overhead gate lengths of up to 12 ft. Features a continuous Duty AC ½ HP High-Cycle motor. Controls the speed of your door with a Gear Reduction Ratio of 40:1. Shuts the motor off after it reaches the stall amp for 3 seconds with the Digital Motor Protection. Prevents noise and absorbs vibration with heavy-duty rubber Noise Isolators. Offers smooth-gliding operation on 6 UGMW rollers. Runs diagnostics easier with LED indicators and add loop detectors to the Advanced OmniControl™ Board. Controls the power to the board with a Power Input On/Off Switch. Includes a #41 Black Oxide Chain. Access your facility quickly and safely with Security+ 2.0® Technology, which virtually eliminates interference and offers up to 2X the range of standard remotes. Store up to 90 remotes with the built-In 850LM Security+ 2.0® receiver. Receive notification of a malfunction with the Safety Alarm. Close your door in a power failure with the Key Release . Protect vehicles from damage with the Electronic Reversing Device that stops, reverses and stops again if it comes in contact with a vehicle. Disperse surges from lighting strikes up to 100 amps with Spike Suppressors. Supports Optional LiftMaster Elite Series Plug-in Loop Detector. Provides operation during power outages with Built-in Battery Backup (batteries included), 900 cycles when used with 12 ft barrier arm. Extend the life of the Gate Operator with soft start/stop operation and a powerful Continuous-Duty DC Motor. Resists the elements with a high-strength rust proof T-6 aluminum alloy chassis. Eliminate unsightly driveway scars with Wireless Dual Gate Communication. Controls the speed of the arm with Dynamic Breaking. Includes a Universal Controller with 8 Inputs. Closes your gate automatically after a pre-programmed number of minutes with Timer-to-Close. Provides reliable operation in high cycle applications, contain no moving parts to wear out with Magnetic Limit Switch Sensors. Makes diagnostics easier with LED Indicators. Adjust to Right- or Left-Handed Operation. Stores up to 90 remotes with the built-In 850LM Security+ 2.0 receiver. o Receiver stores up to 90 remotes. Protects vehicles with Inherent Obstruction Sensing, which stops the movement of the gate if something is detected in its path. 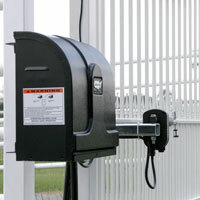 Quickly secure your gate and prevent unauthorized access with the Quick Close/Anti Tailgate feature. Automatically opens when the power fails to prevent entrapment. Disperses power surges with MOVs. Reduce replacement of the arm with its breakaway design, which releases upon impact and can be re-installed. Ideal for the installation requiring faster operating speed, proven strength and reliability the Patriot is unmatched in the industry with 14 years of superior performance. 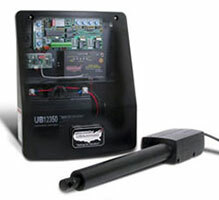 Solar charged gate operators from USAutomatic are the most efficient in the industry. Being the industry leader and educator in solar charged gate systems since 1999 means we know how to do solar right. 2 Boxes 70 lbs./20 lbs. The Ranger series of gate operators is full of innovative design changes and is defining the next generation of low voltage DC gate operators in the industry. Introducing Quick connect harnesses for all standard components, industry first limit switch technology (patent pending), AC charger included with all operators and external reset. Dual gate kit includes water tight junction box and wire nuts with 35 feet of cable.